The most significant paramater for the heating oven with natural or forced convection is maintaining a set temperature. A basic tool to carry out this task is a steering system of the oven mostly used with PID controller. But there are many factors that could have influence on the steering sysytem casuing improper work or even damage. The adequate protections are applied to protect the samples ,batch and the drying oven before over temperature. What kind of hazard situation could place in the oven without OpenDoor sensor ? During the door is opened a cold air gets inside what is record by temperature sensor and the controller turns on the algorithm of heating to maintain set temperature. The air inside is mixed after closing the door and the sensor records real temperature inside of the device and turn off the heating, Due to thermal inertia and temperature deviations caused by fresh air can influence sample characteristics or prolong drying. 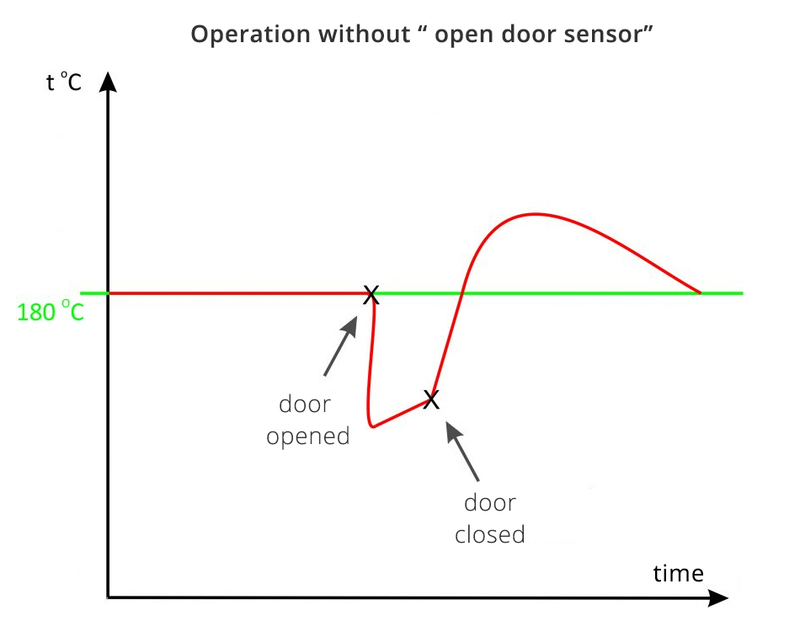 What gives us open door sensor? When the door is opened the sensor receives signal that change of temperature is linked with the flow of the cold air not with real cooling of the device. The controller uses then special alghoritm which protect by uncontrolled heating inside the oven. After closing the door another alghoritm is turned on and its main task is stabilization of the temperature on set level. This is mechanical, basic kind of protection of the Heating and Drying Ovens before exceeding maximum temperature. Generally, the thermic fuses are applied. In case of exceeding of the temperature from 10 to 15 Celsius, this protection cut-out supply of power. This is programmatic kind of protection. Together with required temperature is set maximum value e.g set temperature is 180 Celsius and maximum temperature of the sample is 190 Celsius. The programmatic kind of security closely similar to 2.0. However, in this case process is continued and the controller works in “limp-in mode”.